D/MX 59952 Joiner 4th Class George Lang, Royal Navy, HMS Glorious. Son of John and Susan Lang (née Stephens). Born in Buckland in Moor in the September Quarter of 1916. Died 8 June 1940 aged 23. Believed to be Sergeant (Flight Engineer) Archie Pascoe of the RAF Volunteer Reserve who died 4 December 1944 aged 22. He was among the crew of 6 of a Lancaster (ND932 PG-U) which was shot down over Unterriexingen near Helibronn at 19.38 hours on that day. It is believed that he was born in the Buckland-in-Moor area in 1922. 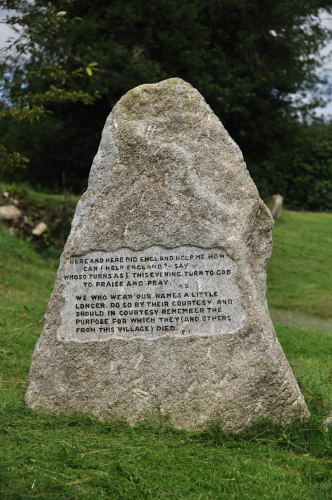 A piece of granite in the churchyard serves as a memorial to both members of the Whitley family who were killed. 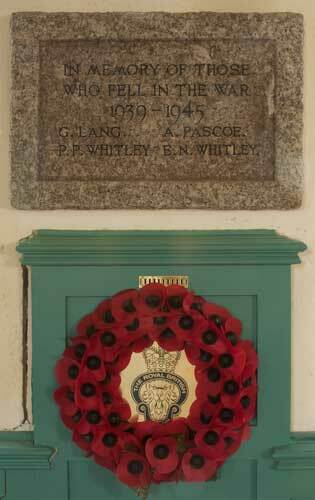 "In proud and loving memory of Edward Neil Whitley MRCS; LRCP. Born July 19th 1918. Husband of Eileen. Father of Michael Neil. Youngest son of William and Elizabeth Whitley. was wounded by mortar fire on June 10th while succouring a foeman. Passing to higher service and reward August 29th 1944 aged 26. Husband of Primrose and father of Elizabeth Clare. "Captain Edward Neil Whitley, RAMC*, who was wounded in Normandy in June and died at a hospital in England** on August 29th aged 26, studied for the medical profession at Cambridge and at the London Hospital, qualifying MRCS, LRCP in 1942. In November of that year, he joined the Royal Army Medical Corps as a temporary Lieutenant after serving as receiving room officer at the London Hospital." * He was a member of 224 Parachute Field Ambulance and was parachuted into France 6 June 1944, attached to the 13th Parachute Battalion. Pilot Officer Peter Whitley was born in Devon in the June Quarter of 1910. He flew with 57 Squadron. He married Primrose Vinen Heron Whitley (née Varwell) of Teignmouth in the June Quarter of 1938. 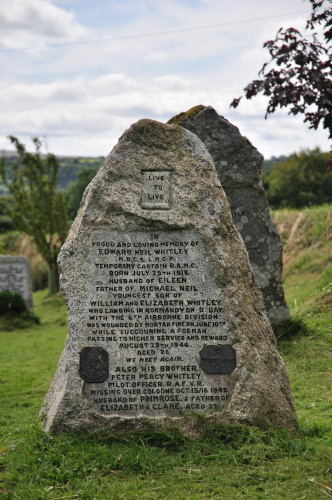 Two Whitley brothers, William (father of these two men) and Hebert, came to Devon from Liverpool where they were better known as the wealthy brewers Greenall Whitley. William bought an estate at Buckland-in-Moor and Herbert acquired Primley House in Paignton which, under a Trust set up by him, became Primley Zoo, later to be known as Paignton Zoo. How can I help England? (and others from this village) died.